Remember I told you I was going on a canoe trip this summer? It was my first adaptability test of the summer. My second one was experiencing two super typhoons in Japan and Hong Kong in September. I’ll tell you about that experience in another blog. The canoe trip reminded me what we take for granted as facilitators. We each need physical stamina, emotional strength and strong problem-solving abilities to adapt to a variety of changing circumstances. 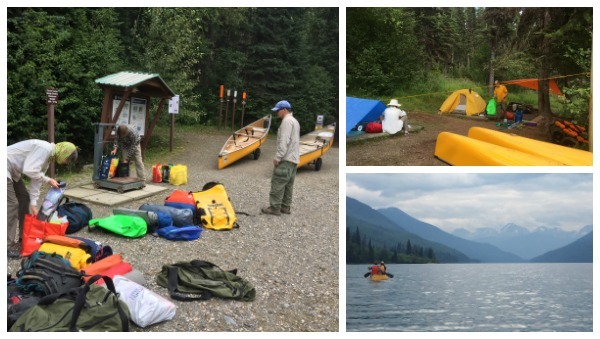 Our canoe trip was a BIG test of my competency around being flexible and adaptable. Every day of this trip presented our group with the need to adapt. It went better than if I had been on my own, because we had several of us who could problem solve together. Let me share the somewhat funny (hilarious in hindsight only) experiences and how we adapted. Then we can reflect on how this mirrors what happens in everyday facilitation experiences. This blog covers the IAF certification competency D3, Adapt processes to changing situations and needs of the group. 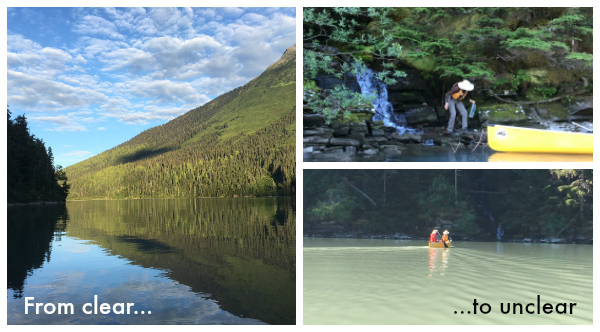 Day 1 – It took us a month of planning and 14 hours of driving to arrive at our canoe trip route called Bowron Lakes Provincial Park. We went as a group of 4. The day before the trip began, we were driving to the park and it started hailing. The hailstones were about 1/2 cm in size. The prospect of canoeing and tenting in a hail storm was not my ideal beginning start. However, we were able to take off in relatively fair weather the next day and we made two long portages, canoed across the lake and arrived at a lovely campsite at 4:00 in the afternoon. We immediately set up our tents as it looked like a storm was rolling in. At this point, we discover one of the tents has no tent poles. No tent poles! Each tent can UNcomfortably hold 2 people. When I suggested all 4 of us climb into one tent, there were definitely no cries of enthusiasm. Considering we had 8 days to go! We debated going back and getting the tent poles. That would have taken a minimum of 4 hours at a “break neck” speed. Plus losing one whole day of leisurely canoeing from the itinerary. At that point it started hailing heavily. Plans for going back for the tent poles were abandoned. We made a lovely, makeshift alternative to a tent consisting of a rope, large extra tarp and a very baggy tent casing without poles. The next morning we decided this was livable for 8 days. We adapted something that was essential — as the bugs were bad and the weather could be severe. It was not an option to sleep out at night unless you wanted to get rescued by the parks staff and flown to the hospital the next day from massive bite overdose. I may be exaggerating here. After months of preparing checklists and ensuring we had every last thing, we forgot the tent poles in the car! We didn’t expect that and we were uncomfortable. But we found an elegant solution. Prepare your checklist, but be ready to improvise when needed. When it happens, take a deep breath. The enormity of this problem lasted a few hours but once we allowed our creative juices to help us find a workable solution, we felt deeply empowered. My advice to you is if you find yourself in a highly compromised situation when you’re facilitating, take a deep breath. Meet with your client and co-facilitators and strategize the best possible solution. In a few hours you will have forgotten about the problem. P.S. We got so good at putting up this elaborate tent alternative, that we got the procedure down from 90 to 15 minutes. This arrived on Day 3. We were so proud of ourselves. We got up early. We canoed out as far as we needed to that day and found a beautiful, idealistic campsite by noon. We had visions of basking in the sun, bathing in the water, bird watching and reading books all afternoon. It only took 30 seconds to realize that none of this was going to happen. I had 5 bites by the time I opened the lunch pack after landing on the site. There were deer flies, horse flies, mosquitoes, black flies, no see-ums, and wasps. We looked up the lake and saw another campsite we could have gone to but it had several canoes already so it was unlikely to be free. There were a limited number of campsites on each lake. Given our tent pole experience, we were feeling pretty adaptable. 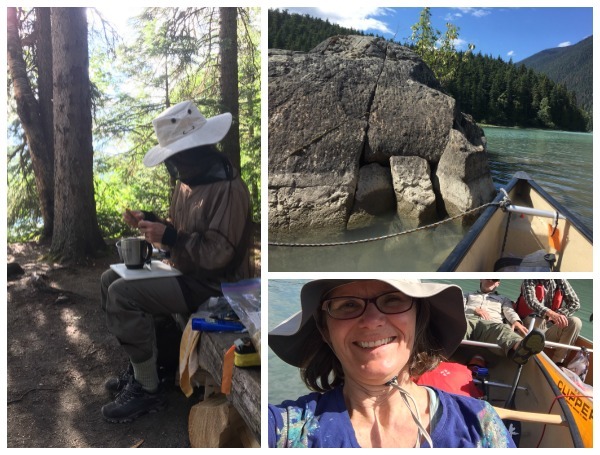 We hopped into our canoes, paddled quite a long way to a single rock in the middle of the lake and looped the canoe rope on the rock and ate our lunch on the lake in our canoes. The rest of the afternoon we wore our mosquito nets on our heads while swimming, bodies protected by the water and heads protected by the mosquito hat. We ate dinner standing up and walking around, allowing 30 second lifting of the mosquito net. Because no fires were allowed, we couldn’t smoke out the bugs – so we went to bed early. Facilitation Adaptation: I remember a facilitation job where after an activity that normally goes really well, the participants buzzed around me like flies complaining and whining about the CEO once she had left the room. I was quite annoyed because normally there’s a really good feeling after this particular activity. I wasn’t expecting the buzzing “flies”. The way I handled this situation is that I asked their permission to have a very open and honest dialogue with the CEO in the room. This helped clear the air. Drop all expectations of how things should be. Look for the opportunity to enjoy the group in unexpected ways. On Day 4 we are entering a new ecological zone on the trip and the water was very cloudy from glacial flower, i.e. sediment suspended in the water. We had been relying on the lakes for our drinking water so luckily we had a hydrology expert on our team. This person suggested we just needed to find a stream somewhere on the lake so that our drinking water would not be full of sediment. Suddenly the problem of no drinking water became an exciting adventure. We hopped in our canoes and we went on a quest for a stream where we could access clear, clean water. Facilitation Adaptation: When facilitating, anticipate periods of fogginess in the group’s thinking. Know that it will be temporary. Keep your eyes open for the breakthrough that will create clarity. Have confidence in the group. Remind yourselves of the earlier positive moments to reinforce the group’s ability to move through this moment of pain, doubt, exhaustion, etc. Day 5 of 7 – The toilet paper (TP) is running low. And two of us have upset stomachs. I don’t think I will go into any of the details, but at this point we were feeling so empowered to adapt, that we came up with quite a few alternatives to toilet paper. 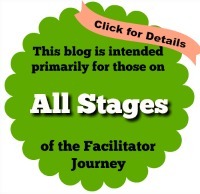 Facilitation Adaptation: You are super prepared. You ALWAYS have your “staples”…your sticky wall, your prepared flipcharts or PowerPoint slides, markers that are not dry, etc. One day, you realize that you don’t have this “must have” staple. What will you do? No sticky wall? Spray flipchart paper and make your own sticky wall. No flipchart paper? State the question clearly and get all the participants to write it down. No PowerPoint slides? Simplify your instructions and put them into short phrases on a flipchart or large piece of paper. There’s always an alternative when you don’t have your usual “must have” facilitator items. I know this was just an excuse to share a nice story with you and to give you a few good laughs. But retelling it reminded me of how empowering it is to overcome very challenging circumstances even in small mundane ways. Being too rigid as a facilitator is not a good thing. Barbara loves “everything facilitation”. She thinks BIG! 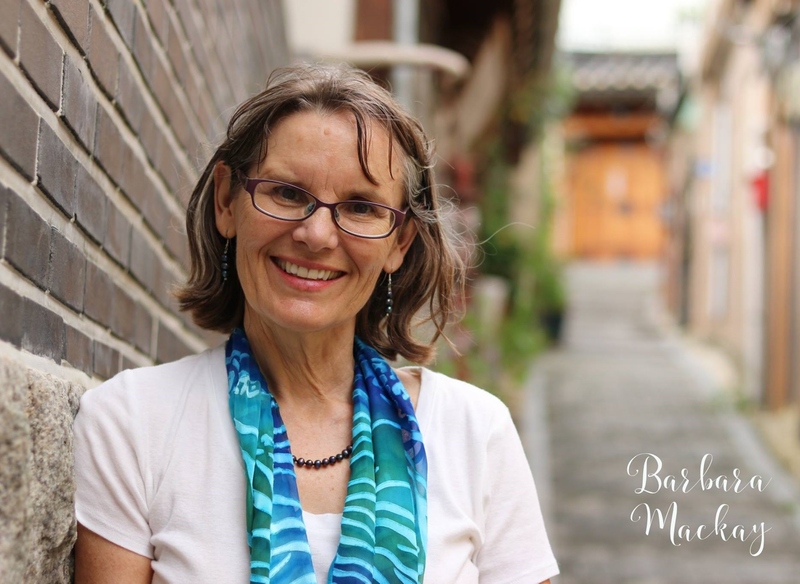 She loves working with other facilitators around the globe to create transformational results for client groups. She loves teaching others how to do that. She loves presenting at global facilitator conferences. She loves certifying new professional facilitators. 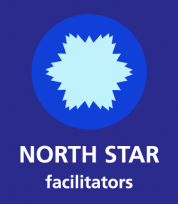 If you also love what process facilitation can do for the world, connect with her – virtually or in person. She believes facilitation processes, used well, will provide the roadmap to a more just and sustainable world. omg Barbara, what hilarious ( in retrospect) camping challenges! You reminded me of the time I was on a road trip with two friends. We visited one 80 year old uncle in Boston, then went on the Cape Cod where we were going to camp . . . and discovered we’d left the tent poles in Boston! Picture the weekend traffic! I stayed with the tent and my 2 friends drove back to Boston to retrieve the poles. While I was sitting there, a young honeymooning couple in the next campsite were attempting to erect their huge borrowed old canvas tent, with hilarious and unproductive results. I was able to spend my waiting time helping them – we all had fun and made a nice connection, and my friends had a merry time on the retrieval run. From that – I would say one of the secrets is laughing instead of blaming!